Over the past few months I’ve gotten some questions from readers about what “Mexicorn” is. It appears as an ingredient in several of my recipes. It’s produced by Green Giant – simply a mixture of corn, bell peppers, onion, and seasoning. 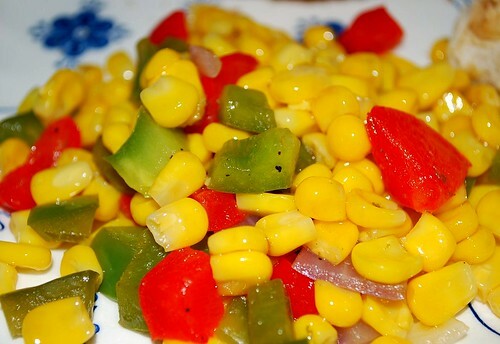 But I also love to make Mexicorn as a fresh side dish to go with enchiladas and tacos. The light and crunchy combination of veggies is a refreshing accompaniment to any zesty meal. Heat the olive oil in a large skillet over medium heat. Add corn, bell peppers, red onion, salt, pepper, cumin, and lime juice. Cook, stirring occasionally, over medium heat until vegetables are slightly tender, about 5 minutes. Remove from heat and toss with fresh cilantro.